COLUMBUS, OHIO (Sept. 25, 2018) – When it comes to eClinicalWorks special events, healthcare professionals can always look forward to memorable moments. Scriptel Corporation has experienced a slew of its own over the years. What has that meant for this eSignature technology giant and health IT products vendor? Scriptel staff has a blast sharing its digitizing solutions at eClinicalWorks User Days in Phoenix, Seattle, and points in between. Heck, they made a big splash when Scriptel served as Silver Sponsor of the eClinicalWorks National Conference on Lake Grapevine in 2017. Everyone at Scriptel enjoys supporting eClinicalWorks and its amazing clientele. So, while other commitments will keep them from sharing directly in the fun had by eClinicalWorks team members and attendees of the eClinicalWorks National Conference Oct. 5-7, 2018—at Gaylord Opryland Resort & Convention Center in Nashville—Scriptel will be there in spirit and on social media. 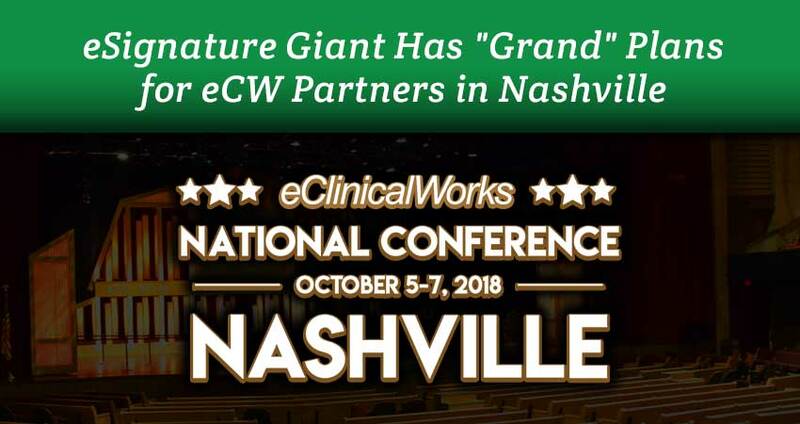 Indeed, those at the eClinicalWorks National Conference in Nashville can look forward to daily posts from Scriptel headquarters on Facebook, Twitter, and LinkedIn. In “Moment of the Day” style missives, the company plans to spread word of the health information management event far and wide through its own network of loyal followers. They can also claim a 30-Day Risk Free signature pad trial at scriptel.com/sales/30-day-evaluation-kit. eClinicalWorks offers healthcare technology solutions in partnership with Scriptel, which provides secure, robust support for its cloud-based service offerings. This then allows health IT and other healthcare professionals: Focus on care delivery, ensure optimal levels of information security, fulfill related obligations, and achieve zero-failure rates. Scriptel has deployed more than 3 Million rugged, hassle-free, Citrix-Ready handwriting recognition solutions (i.e., capacitive touchscreens, signature pads) worldwide. Each of its USB-interface and custom OEM components is backed by Industry Best service, unrivaled technical support, and user-friendly pricing. Save time, money, and worry—at Scriptel.com. SCRIPTEL CORPORATION leads the way by advancing rugged, reliable eSignature and signature capture technology. Our Citrix Ready, plug-and-play hardware and software solutions make easy work of document signing, electronic recordkeeping and practice management in Dental, Healthcare, Retail, Tax Prep and other dynamic environments. Scriptel (est. 1982) has a history of leading through innovation, bringing the first peripheral to mimic superior pen input on an LCD screen to market. Today we produce and provide unmatched support for a full suite of ScripTouch® signature pad and workflow products, including EasyScript™, ProScript™ and mSign®. Scriptel is based in Columbus, Ohio, and has deployed more than 3 Million products worldwide. Which of our hardware and software solutions best suit your needs? Find out! Request a 30-Day, Risk-Free Trial at Scriptel.com. Copyright © 2018. Scriptel®, ScripTouch®, Assist™, EasyScript™, mSign®, OmniScript™, ProScript™, StaticCap™, and Sign and Save™, along with their associated logos, are the property of Scriptel Corporation.